How can a teacher without theatrical experience teach a course in theatre arts? How can a teacher inspire self-conscious students to perform before an audience? This book of activities is designed to build confidence in each student with non-threatening evaluations along the way. 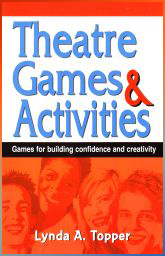 This drama text begins with basic group games and gradually expands to more challenging exercises. Its emphasis on group and individual activity builds verbal and non-verbal communication skills. Chapters include: 1. The Planning Process, 2. The Challenge of the First Meeting, 3. Getting Acquainted and Acclimated, 4. Non-Verbal Group Activities, 5. Non-Verbal Individual Activities, 6. Verbal Individual Activities, 7. Verbal Pair Activities, 8. Verbal Group Activities, 9. Written Activities, 10. Evaluation, Assessment, Rewards, 11. Grab Bag. The many exercises in this book can help any teacher, even one with no acting experience, create a safe zone in their classroom where students can take risks, make mistakes and learn from them, building both confidence and cooperation.